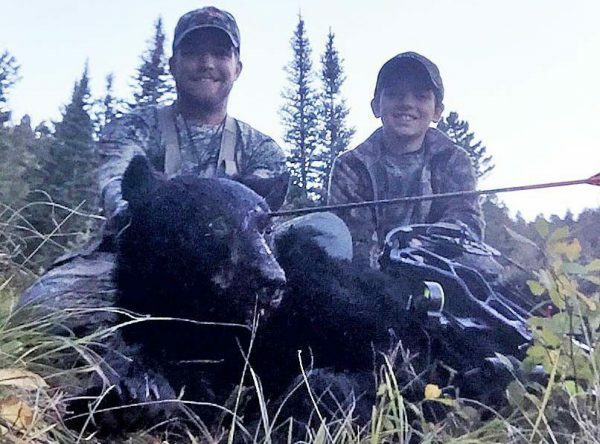 Even for Montana, the encounter two brothers had with a black bear that ended with a trip to the taxidermist is one hell of a story. A bowhunter struck a charging bear right in the eye ball, penetrating straight into its head. Russel Ferster, 24, told the Billings Gazette recently how he was hunting for elk with his 11-year-old brother in the Crazy Mountains northeast of Bozeman. They stopped the truck to make a few cow calls and no longer than 15 minutes and they heard a rustling. But what they expected to be a bull elk turned out to be a charging black bear. The bear stopped at about 15 feet away and then pounded up and down on his front legs, clearly agitated and baring his teeth. Realizing he did not have a gun or bear spray with him — a big mistake — he turned the only weapon on hand, his bow and arrow and put a broadhead right into its eye socket. “I hit him in the only place that would stop him in his tracks, just above the eye, and the broadhead managed to penetrate into the brain,” Russel told the Gazette. No other way to describe it than a bulls eye in more ways than one. As the bear fell it was so close, the end of the arrow struck Russel in the foot. But despite taking an arrow straight to the eye ball, the broadhead barely penetrated the bear’s skull. Had it been just 1/16th less, it would not have put the animal down.